Perfect Pie - Every Time! Learn to make perfect pie! 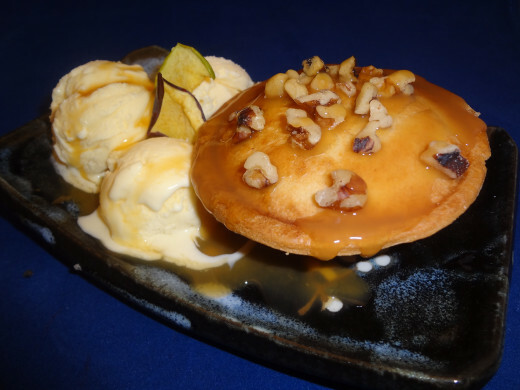 Serving a fantastic dessert is the end of every perfect (or not so perfect) meal. Dessert is super important! It's the hosts last chance to satisfy their company. 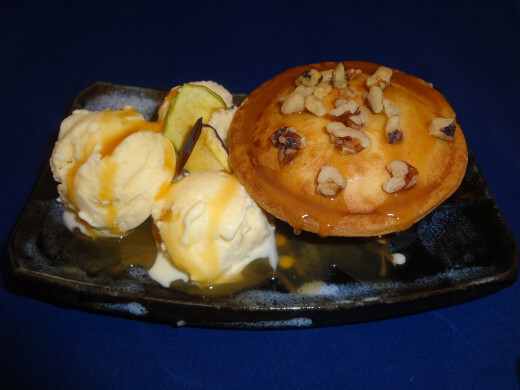 Whether it be a restaurant manager or a housewife, dessert is the last dish to delight your guest. If the entire meal sucked - you can totally reclaim your dignity with a great pie! Your patron will leave the table, licking their lips with a full stomach even if the entrée insulted all the senses. For the beginning cook, making pies and pastry can seem daunting. While making your own crust is a terrific skill to have, it isn't a necessary one these days. I can buy pre-made pie crusts in the store for about a dollar a piece. I can't make a better pie shell myself and for a dollar - I don't think I could beat the price when you include my time. 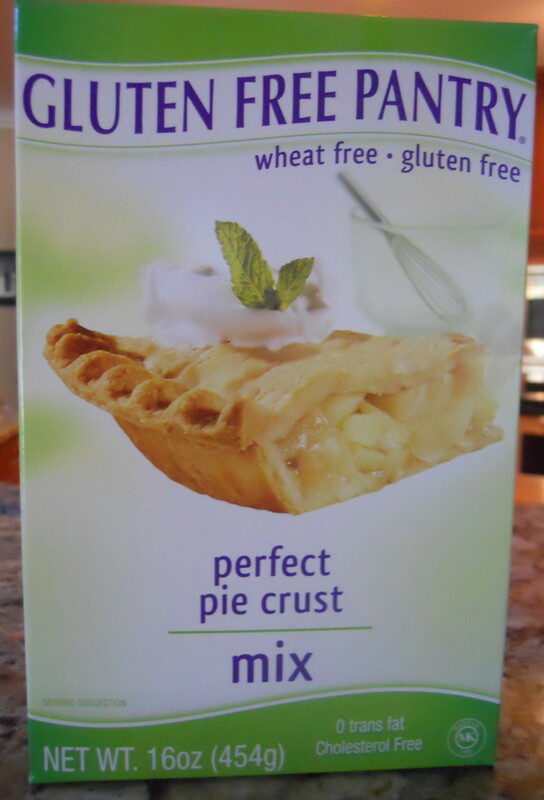 I prefer to just buy refrigerated pie crust. One challenge for real cooks everywhere is that recipes in books and on the Internet have usually been made in a test kitchen. Those kitchens have the advantage of having the most expensive equipment known to man. Commercial ovens and cookware can and will change the end result of the dish. The cook book photograph may be impossible to achieve with a general kitchen stove. A trained cook can learn to work around these challenges while a new cook may fumble learning those basic skills. For holidays or birthdays I will spend hours making special dishes. For everyday practicality I want to be able to make a dinner and dessert in less than an hour. I want the dessert to look and taste like I spent all day preparing it though. I was shopping recently and bought a Mini Pie Maker. Normally, I wouldn't buy something like that but it was on clearance for $14.99. I decided if it could make pie better than me, I'd love to have that! 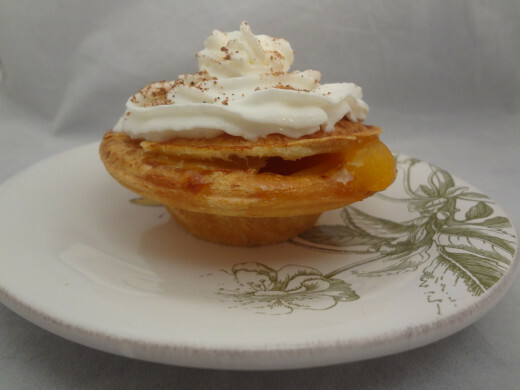 I am in love with the Bella Mini Pie Maker! The pie turns out of the pan, flawless, every time. It doesn't matter what filling I use the pies are delectable. The Bella Mini pie maker includes very few recipes. I experimented with some of theirs and made a few of my own. The pie maker includes the cookie cutters needed to make the exact size and shape to fit the molds. The instructions suggest that if you use refrigerated dough from the grocery store, you should roll it out to a 1/8 inch thickness. The end result will yeild enough shells for 8 pies. I do agree that you could stretch it to make 8 pies but I don't think it's best. I unrolled the dough and immediately cut four large rounds out and one small round. I took the remainder of the dough, rolled it out, and was able to cut out two more small rounds. 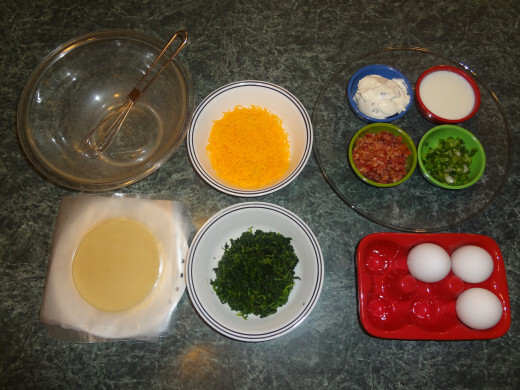 Then roll the left over smaller bit of dough for your final and fourth small round piece for the top of the pie. 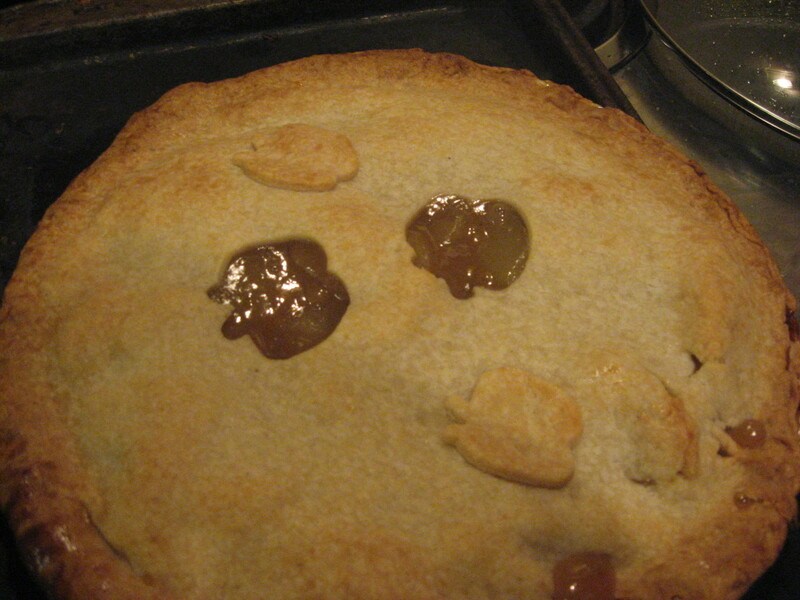 The thicker bottom pie crust works best to hold heavy fruit fillings without stretching it. The ration of pie crust to filling is excellent as well. The pie crust did not break, weep or tear one single pie. I cooked each pie for exactly 12 minutes. The pie crusts were all browned and the taste was beyond compare. I used regular canned pie filling for each fruit pie. 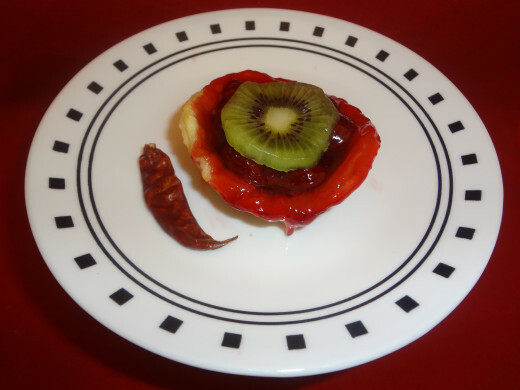 I garnished them with fresh or dehydrated fruits, zests and nuts. Making a perfect mini pie is a snap! 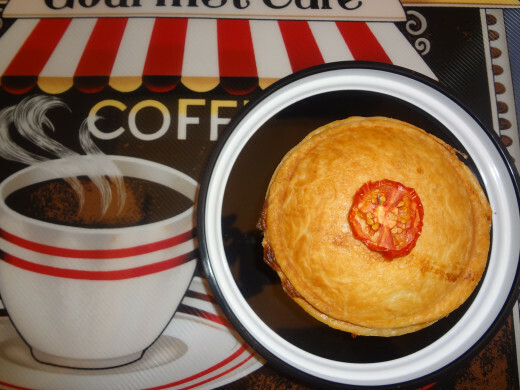 Mini Pies for Lunch or Dinner! Pies aren't just for dessert! I love making one dish meals like quiche and pot pie. There are many advantages to making portions in smaller serving sizes. 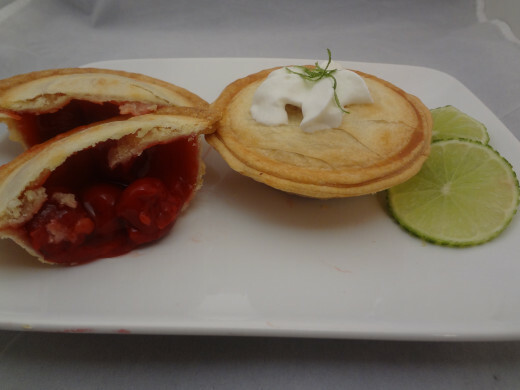 My kids can take one of these mini pies to school for lunch or dessert or pop one in the microwave for a quick breakfast. 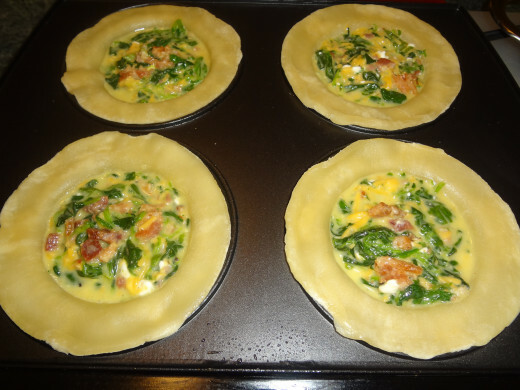 I made a portion of the quiche mini pies in phyllo dough and the other half in regular pie crust. I tried them using a Phyllo dough bottom crust sans top crust and they were equally scrumptious. 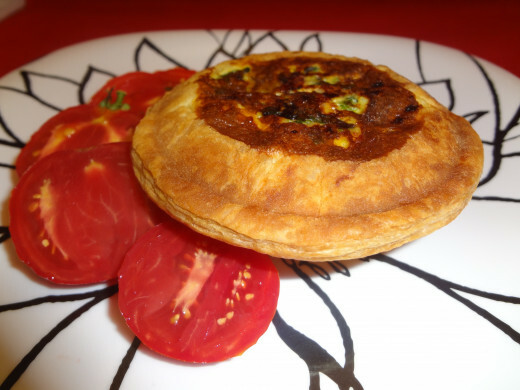 The mini quiche pies would be fantastic for a lunch item if you are entertaining guests. 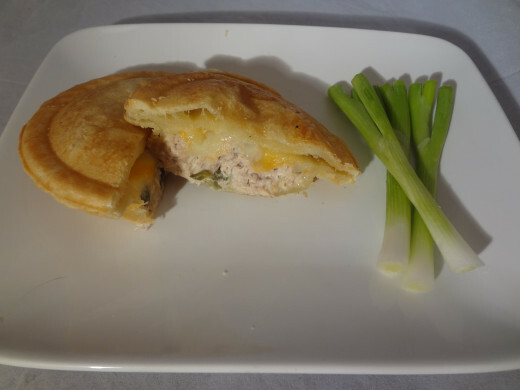 One of the recipes that was included in the Bella Mini Pie instruction booklet was for a tuna cheese bake. I slightly changed the recipe and used canned tuna in water, mayo, scallion onions and capers. I topped them with cheddar and mozzerella cheese. I also used phyllo dough and my husband thought they were quite tasty. For the most part, I followed the directions and recipes in the booklet. 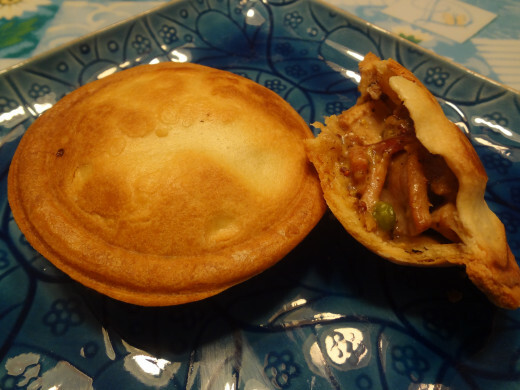 I made a chicken pot pie filling and quickly made mini pot pies. It took me a total of about 30 minutes total cook time to make eight mini pies. It would have taken at least an hour to bake a whole pie in the oven. Each time I used phyllo dough - it cooked much quicker. The pies took about 8 minutes and the tuna bake and quiches took about 10 minutes. 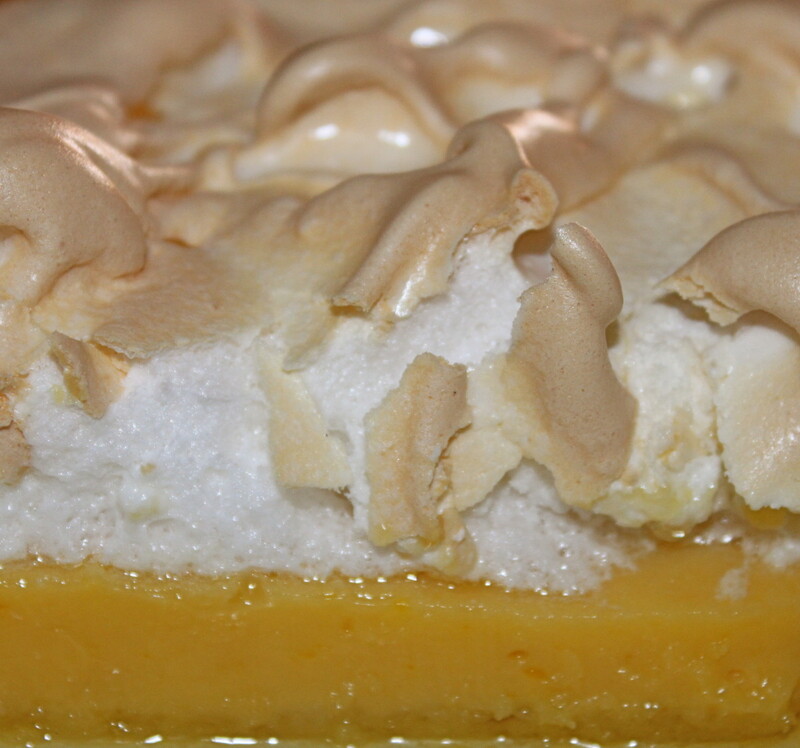 Glass pie plates and duller metal pans are best for baking pies. 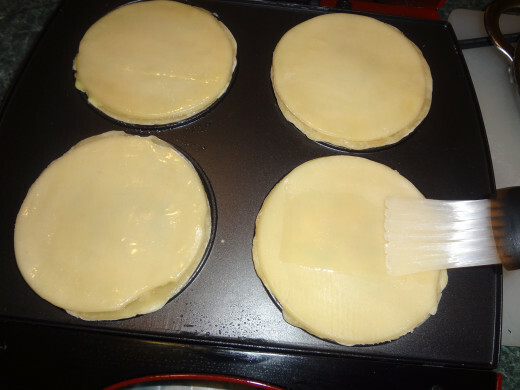 Those materials will absorb and retain heat evenly which makes them ideal for perfect pie crust. Shiny metal pans will cause a soggy bottom! Ceramic and clay are also great heat conductors and make appropriate dishes for pie baking. If the recipe calls for a lattice top it may be because the filling requires venting. Make sure to use a lattice top if it is specified. Fruit Pies should be bubbly in the center when they done. If the filling isn't cooked properly the filling will be too thin. Look for bubbly liquid around the slits in the center and edges. Make sure proper cooling time is allowed. 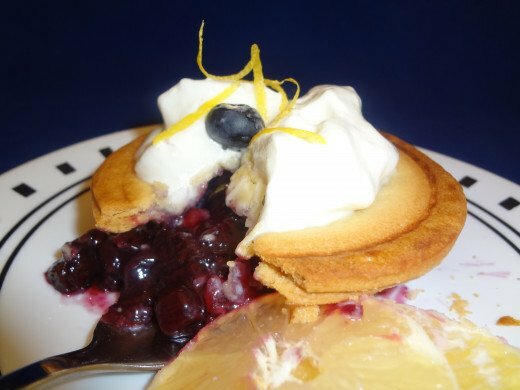 Cool fruit pies for a minimum of two hours to prevent the pie from falling apart. Fruit pies can sit at room temperature for about 24 hours safely. They require refrigeration or freezing after this point. To freeze fruit pies, let them cool at room temperature completely. 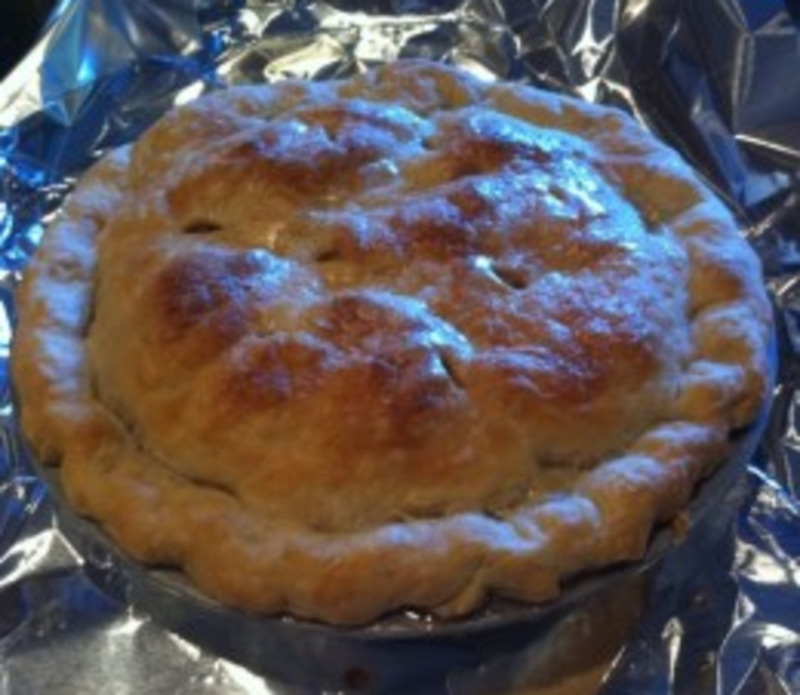 Place pie in a Ziploc bag, label, date and seal for safe storage for up to 4 months. To serve frozen pie, thaw at room temperature. Preheat at 325 until warm if desired. Process the pies and crusts into a crumb mixture. Add the brown sugar and lemons. Pour mixture into a baking dish. Melt butter in the hot water or syrup and pour over all. Cover the dish and place in a larger baking dish that contains water. Bake in a 350 degree oven for 1 1/2 hours to 2 hours. 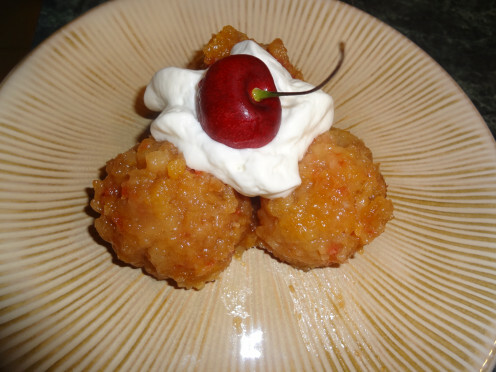 Serve with whipped cream topping or a lemon sauce. Decades ago, tea houses and diners would make use of any scrap of unsold food. Left over slices of pie and cake would be put it "the Betty jar." The Betty Jar was a large, closed container in the refrigerator. Every few days, they would take all the random pieces of pies and cakes and toss this decoction together and make a crumb mixture. The mixture, while not pretty, tastes marvelous! It's a sweet bread pudding that was originally topped with a zesty lemon sauce or glaze. 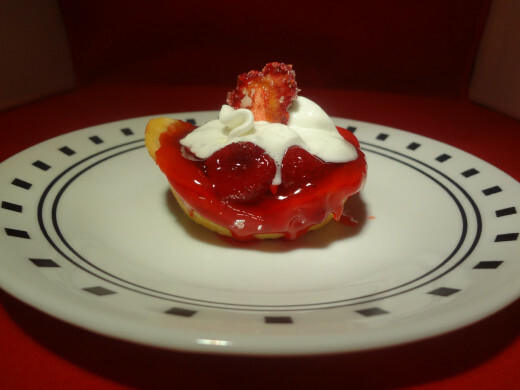 Parties, bar-b-ques or events that render large amounts of left over pies are a great beginning to a delicious Fruit Betty pudding dessert. Thank you so much Patty! I used it again this year for Thanksgiving...in just a few hours I was able to kick out 16 great pies with four different flavors...everyone got their favorite! I use it a lot and it's still has no scratches on the surface and makes 4 pies in 13 minutes! For 15 bucks...I got my moneys worth. 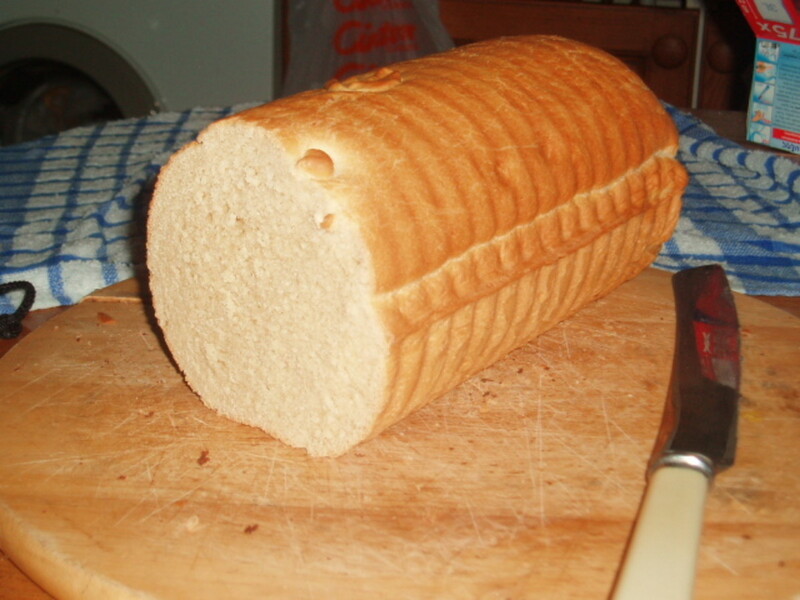 Thsi is certainly great, useful equipment that puts out a splendid baked product. Plus, it is not even very expensive on Amazon.com. How many of us get tired of a pie before it is completely consumed, or want a little of several varieties of pie? I think this product is the answer and am glad you wrote about it! They are handy! 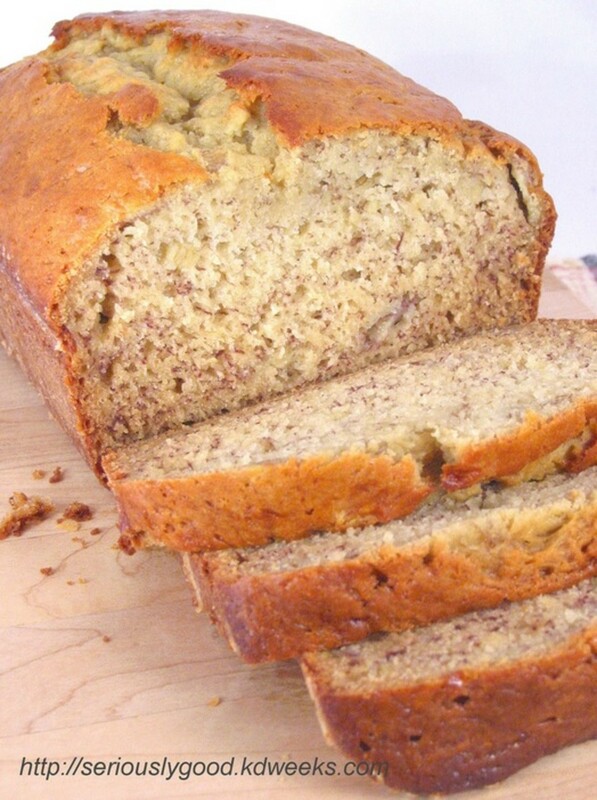 So easy to make a breakfast, lunch, dinner or desert in a pinch! I bet you'd make some killer pies! Thanks Dzy! That's funny you thought they were big pies! lol. I wish I could make a good pie crust but all I ever end up with is a big mess:) I have done it before but it wasn't nothin' special! I love dump cakes! So easy and makes everyone happy! Came back for another look. Can you tell I'm craving Pies :) I really have to try to find one of these pie makers. Kelley, I must get my own mini pie maker. This is fantastic. 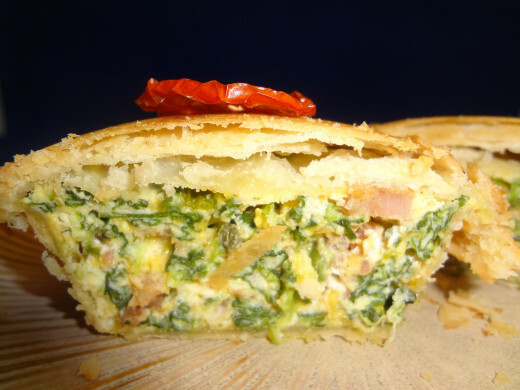 Pies are a cook's delight and always welcome on the table or in a lunch box. Great hub that I am bookmarking. Thank you! Oh Dump Cake is absolutely delicious! I used to have people at work that would specifically request that I bring Dump cake for lunches and parties:) So easy too - just dump it all in and bake! Poke cake is also one of my favs....all time....make a white cake - poke holes in it with a fork and dump your favorite jello flavor over the whole cake then refrigerate for several hours. Top it with Cool whip - AWESOME cake! Anyway, this is a very interesting and informative hub. The Betty jar looks awesome too. We definitely don't have it in the UK, nor dump cakes. Yeah I tried to find research on the Betty Jar and couldn't either! I was so hoping someone would check in that knew about them! But it would have been when gram was young so many, many years ago. It's good stuff too! Reminds me of a dump cake! Hi Terrye! Thanks so much! I just made a whole bunch of them and I didn't even get one! They were gone in minutes at the barbque my mom just had. These look scrumptious, Kelly! Voted up and shared all over. Hi Patty! Thank you so much! Hey teacher! Oh I love mine! I calmest didn't buy it and now I'm so glad I did! My sister loved the chicken pot pie and I'm getting ready to try a shepherds pie in there. I bet it will be great! Thanks a lot! Hey Tammy - I finally got the steps down pat - I made 16 little pies in about an hour yesterday for a party at moms. I made 8 peach pies, four apple and four pumpkin in no time! Every single one came out perfect! Loving that little machine:). Thank you! I have had mini pies before but always in a restaurant. I don't think I have ever known anyone who actually makes these in their home. 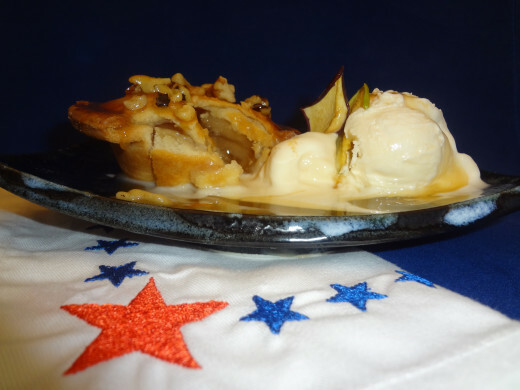 Great recipe; I'm stashing this one away for pie baking season, coming up soon. This Hub is completely delightful! Rated Up and more and I am sure to try mini pies. 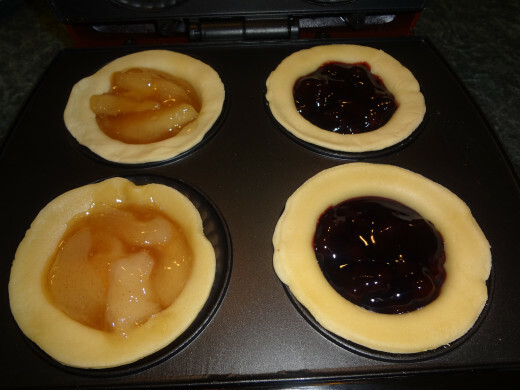 At the end of the school year last year I got a Bella mini pie maker as a gift...I absolutely love it! I use mine mostly for meat pies..chicken pot pie is the favorite around my house! Wow! This hub is as stunning to look at as it looks yummy. That is a fabulous idea. Perhaps even I could make a good crust. Excellent! LOL Martie! ahahaha I know - I do love some good pie! lol And hey - it is totally worth the half hour because even if I sense my husband has had a stressful day - I can say, "made some pie today!" And I hear him change the thought process to "hmmm really?" haha So by the time he gets home he has had just enough time to get in a better mood looking forward to a quick snack while he sorts out his details. I do not like making pie crust - I like buying the stuff because gosh it just adds so much time to the whole business:) I want to get right to the decorating part! Hey Cyndi - thanks! That's funny because my husband always kind of makes fun of me for doing some of the stuff I do (like spending hours rolling sushi just so he can eat it in a few minutes:) lol I can tell you he was NOT pleased about the time I thought that having a green swirl like a jelly roll through your meatloaf looked so cool - I had to try it! When he sliced it open and (gosh I knew he was gonna be surprised!) he said, "what the hell did you put in the meatloaf?!" I LMAO because I didn't realize how passionate he was gonna be about not liking that perfect green swirly through that ugly burger? He told me to never do that again! hahaha I said, "eat it - it's pretty and therefore - good for you!" Hey prasetio - that's funny - yeah you share this with your mom so she can make a perfect pie for you:) LOL That is using your thinker! Thank you so much! Hi Lord! Wow - love the new avatar! Thanks - too bad you don't live closer too - I had dozens of pies to get rid of after I was finished with this hub! LOL I had to try a bunch of kinds though or how would I know if it worked and kept working after just a few uses? Hi Drbj! I bet your pie patrons weep tears of joy! You can't fool me - I bet you're a terrific cook! But even if you aren't that pie maker will make you totally look like you know your business in the kitchen:) lol Thank you so much! CHICKEN POT, CHICKEN POT, CHICKEN POT PIE!!! YUMMMMM! Okay, you make all this look so easy. You're a regular pro! You could like open the "RealHousewife Restaurant" or something. Then, we'll get Chef Ramsey to give you rave reviews because he would! Hehehe. Brilliant, beautiful hub! Shared, voted, pinned, tweeted...it's just all so lovely! This was so visual and beyond my expectations! Love those pies and the delicious meal pies. 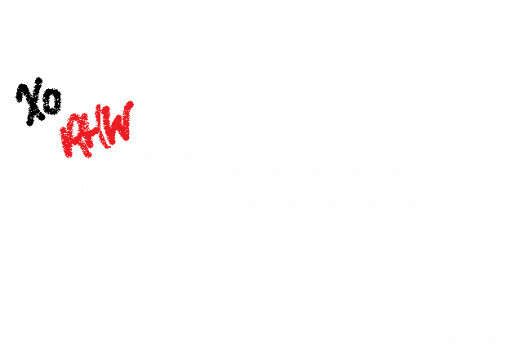 You forgot a Jamaican beef patty, but RHW style, ya know? Nice pics! Thanks Kelly! Just wanted you to know, Kelly, that the pies I make never weep. It's the guests who are forced to eat them who shed the tears. But now, armed with the professional knowledge in this remarkable hub, I shall sally forth - or is it Kelly forth - to create praiseworthy mini pies under your learned tutelage. Promise. Hey Julie - thank you! You can never go wrong serving several flavors of pie:) lol. Oh wow that's a great idea Mama Kim - you should write a hub about that! Yeah I was being silly - if you noticed the subtitle below - you can leave your top off? Lol. Yes...they used the intact unsold and untouched pie but I did get the willies thinking about that:) lmao! I really do cook like this all the time. My friends and family will tell you that I'm a huge food fanatic! I am the one who has no Tupperware because everyone wants to take something left over home:) lol. All the ladies in my family are pretty good cooks. Sunday family meals were a regular event when Gram was alive. I WISH the house next door was for sale - if it goes up - you'll be the first to know!! Hey Ruchira - thank you so much! My family is sick of pie right now:) LOL. I wanted to do a bunch ofmdifferent ones so everyone could see how gorgeous they ALL come out. Every one! And you can tell that crust is perfect. It's awesome and Pumpkin is my all time favorite pie. I made pumpkin in regular shells and phyllo dough and oh - equally scrumptious! Hi Susan! Somehow I knew YOU were gonna like this hub:) lol. I tell you - that was $14.99 well sent dontcha think?? this recipe is more than perfect! Thank you for sharing your delicious secret. These are so cute. I love the idea and all the variations you offered. Great job! 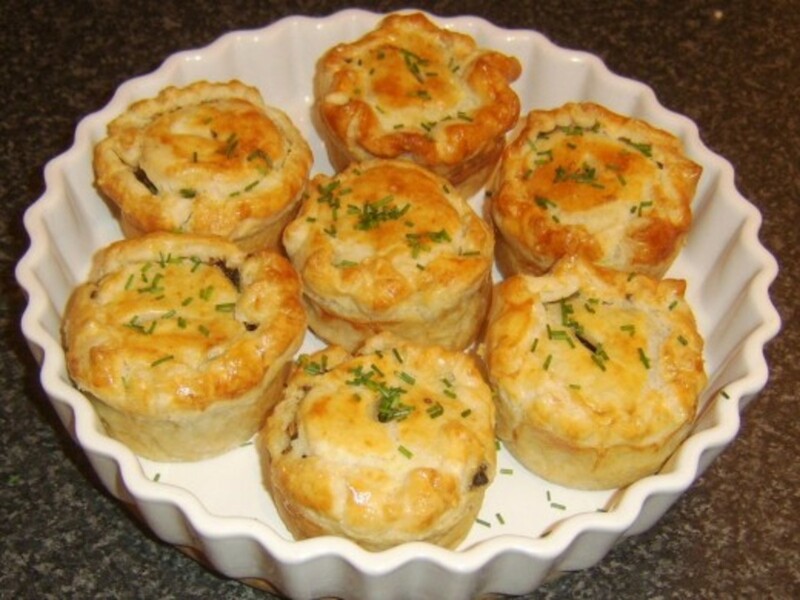 Your mini pies are so cute and truly perfect! 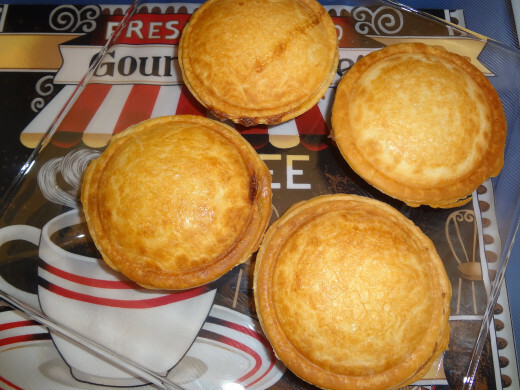 I make my mini pies in muffin tins and call them cup-pies ^_^ I love the crust to filling ratio in smaller pies. Voted up and pinned. RealHousewife, what up with the, "Joe Crocker - You Can Leave Your Hat On, striptease video? Did you put that ad on your HubPages article? Your article was excellent, it didn't need Joe Crocker. Is the house next door to you for sale? Wow! you really know how to my taste buds going. Voted up useful and awesome, thank you, Joyce. My kid started school today and maybe I could indulge in my favorite...pumpkin pie. once again...you took great pains in presenting the various pies and baking them...cheers!! Can I place an order? I want ten of every pie here. Everything looks so good and you've made me very hungry. I make mince meat pies at Christmas as well as tourtières and the Bella would save me so much time. Have to look for one of these. Hi Glimmer Twin - the pie maker is super cool! I just can't believe how perfect everything comes out - I took so many photos because they say it all. Not one pie had to be wasted. I never ever hear anyone talk about Betty Jars anymore! My gram worked at the Vhase Park Plaza in head of food control for a couple of decades. I learned about it there - couldn't find anything about it on the Internet either! Thanks Lela I've really been practicing with photos - it's a huge part of the fun of a hub for me:). I was gonna try meat pies tonight in the pie maker...sort of shepherds pie but I make mine in red wine and onion, beef, pork, carrot, potatoes - I let the meats and veggies simmer in the red wine a while:). SOOOOO good! Hi Carol - thank you so much! I wish I could beam you a pie - they are terrific! Hey Kelley - I can't believe what a lucky score this was for me! I almost didn't buy the darn thing but then I went back thinking, it probably won't work but for 15 bucks I'll try. I can't believe how well that thing really does work! Hi iefox5 - thank you! 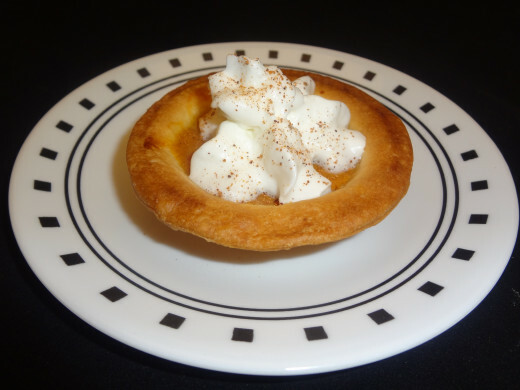 You won't be disappointed if you try that little mini pie maker:) lol. You might get fat but you'll be happy!! My daughter would absolutely love this and so would we. The Betty jar is fascinating and such a yummy idea. Of course we don't usually have left over sweets at our house but I could always hide somethings. Great hub! You could use it to make Aussie Meat Pies! I've always wanted to try one of those. Your photos are getting to be mouth watering! I love this baby pies. I am thinking I could use one right now. I love the great photos. Super hub and a delicious one to boot. Vote UP. I'm always happy to know and try recipes for Hubpages. Thanks!!! You totally need this pie maker Thomas - you can put anything in it, close it up for 10 minutes and viola buddy! You got pie! As I started reading this I was hoping for a tutorial on "food" pies rather than "dessert" pies...(i.e. pot pies and such) You did not disappoint! Now...for my standard lame cooking (baking this time) question...how do you make a pie weep and what does that mean?